In the summer of 1973, I made my first visit to Ravenna, Italy. 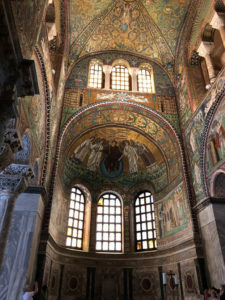 I had gone there to see the Byzantine mosaics that I had studied earlier that year in a history class. It was a short visit, culminating in a Beethoven organ concert at night in the Basilica of San Vitale. The mosaics of Ravenna were stunning to see in person. And then I left. Many years later, after retiring from work, I began to take mosaic classes in Arlington, MA. It began with a two and a half hour ‘taster’ class and proceeded to more mosaic ‘experiments’ and more classes. When planning a vacation in 2017, I was looking to do something different than only being a tourist. Someone suggested taking a mosaic class in Italy. I had not thought about Ravenna for years. In July 2017, I returned to Ravenna to take a five day mosaic class at The Mosaic Art School. The class was wonderful with students from various countries. While I did not create a ‘masterpiece’, I could see my progression from day to day. 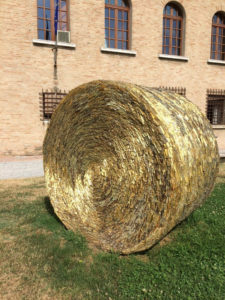 In total, I was in Ravenna for six days. And six days was not enough. In June of this year, I returned to Ravenna to take another mosaic class. But this time, I planned to spend more time in Ravenna and also to visit some cities close to Ravenna that are easily accessible by train. Ravenna is in the Emilia Romagna region in northern Italy. It is a UNESCO World Heritage site because of its 5th and 6th century mosaics. Ravenna was the capital of the Western Roman Empire from 402AD to 476AD. 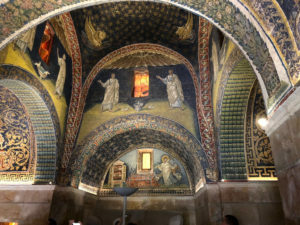 Its ancient history is rich with some interesting more recent historical events (supposedly the mosaic stars in the Mausoleum of Galla Plaida were the inspiration for Cole Porter’s song Night and Day). Ravenna is basically synonymous with the word ‘mosaic’. Mosaics are present everywhere; not just in churches or museums, but on street corner signs, on benches, in parks, on sidewalks, on modern buildings, and of course in the mosaic studios and schools throughout the city. But Ravenna is also a food lovers’ paradise. The Emilia Romagna region is home to other wonderful cities known for their regional foods. Parma is famous for its hams and cheese. Modena for its balsamic vinegars. Bologna for its fresh egg pasta dishes. And all of these can be had in Ravenna. Seafood is also in abundance in Ravenna. Marina dal Ravenna on the Adriatic Sea is a short bus ride away and is worth a visit for lunch or dinner. Beginning around 6pm every day, prior to dinner most cafes offer ‘aperitivo’. Aperitivo is actually the pairing of a drink (alcoholic or not) with an assortment of finger food. It is a time to relax, read, spend time with friends or just people watch. The amount of food offered ranges from satisfying to an overabundance making it unnecessary (or impossible) to eat dinner. Dinner time is at 9pm. Breakfast is at 8am. Lunch is at 1pm. Aperitivo is at 6pm. It is a lot of eating. Ravenna is a small city. It is a ‘walking’ (or biking) city. In the center of the city there is a pedestrian zone with many cafes and shops. At the center of the zone is the Piazza Del Popolo. From early morning to late at night it is busy with locals and some tourists. At night the area is filled with families eating dinner or walking around having gelato. The pace is slow and meandering seems to be a favorite past time. Compared to other famous destinations in Italy (Venice for instance), Ravenna is relaxed; uncrowded and, the local people are very friendly and inviting. Even those who do not speak any English will have a long conversation with you in Italian even when you have tried to make it clear that you do not speak much Italian. And Ravenna is a safe place. Possibly the most dangerous thing is the number and swiftness of the bike riders. Ravenna is also home to Dante Alighieri’s tomb; live theater; an annual music festival; ballet, and other cultural events. But for me, it is about the mosaics. Aside from the Byzantine mosaics, contemporary mosaics abound in Ravenna. The Museo d’Arte della cittia di Ravenna (MAR) houses contemporary mosaics as well as paintings and sculptures. The museum is also home to the International Mosaic Documentation Center whose mission is research, study and the promotion of mosaic art. This year I returned to the Mosaic Art School to take the five day ‘Standard Intensive’ class during which I made a Byzantine reproduction using the ‘double reverse’ technique and another reproduction using a contemporary technique. While the ‘double reverse’ technique was fascinating and fun (working on lime drawing out the tesserae, using a multitude of Italian smalti and some marble, gluing, washing, flipping from the temporary lime base to cement, etc. ), the skills I acquired during the five days will be extremely useful as I move forward with future mosaics. I gained a much better appreciation of where to begin with the subject, how to create flow and possibly most importantly, just about mastering cutting using a hammer and hardie. I have made a few friends (all ‘locals’) in Ravenna whom I hope to stay in touch with. And although it is a long time off, I think I will be returning to Ravenna again next year to make a floor mosaic!